It happens every time without fail. My spirit breaks a little more every time I see a memorial, another example of the depths to which our species have plumbed. Does feeling this way make me weak? Or am I resembling a human being after all? On 9-10 November 1938, Kristallnacht (“the night of broken glass”) was a well-organized “pogrom”, a series of violent attacks by Nazis against Jews and their property in Germany, Austria, and Czechoslavakia’s Sudetenland. “Pogromnacht” (or Reichspogromnacht) is a truer description; the “prettier sounding” Kristallnacht hides the brutality of “the night of (broken) crystal” referring to broken shattered glass from windows to synagogues, homes, and stores owned by Jews. The numbers were appalling: at least 90 dead, 30000 arrested and detained in camps, over 200 synagogues burned, and over 7000 Jewish businesses damaged or destroyed. The outbreak of coordinated actions against Jews marked the beginning of state-sanctioned violence. With the Pogromnacht, the state opened the door to undisguised escalation of savagery: a turning point directly leading to the Holocaust. In the university town of Heidelberg, the earliest recorded presence of Jews dates back to the 13th-century. Jews gathered in what is now the Old Town and converted the building they were using into a synagogue in the early 18th-century; the community built a new synagogue at the same site in the late 19th-century. The synagogue did not escape violence and was burned to the ground. Alter Synagogenplatz or Old Synagogue Square is all that remains today with memorial plaques; the names of people arrested, deported, and killed; the outline of the synagogue’s walls in white marble; the entrance and windows marked in grey granite; and twelve sandstone cubes representing pews and the twelve tribes of Israel. Jews have lived in Heidelberg since the 13th century, in spite of having been subject to oppression and persecution time and again. In 1714, the “Blue Lily” house situated on this site was converted to a synagogue. In 1878, the community built a new synagogue in contemporary style. On the night of 9-10 November 1938, Nazi storm troopers set fire to the synagogue. In 1939, the Jewish community was ordered to pay for the demolition of its ruined synagogue. On 22 October 1940, the Jews of Baden and the Palatinate were deported to Gurs camp in Southern France. Only few of them survived the Shoah. Between 1941 and 1945, more Jews from the area were deported straight to the death camps. After the end of the war in April 1945, a Jewish community was re-established in Heidelberg. The present-day synagogue is situated in the Weststadt city district, at 10-12 Häusserstrasse. It was inaugruated in 1994. 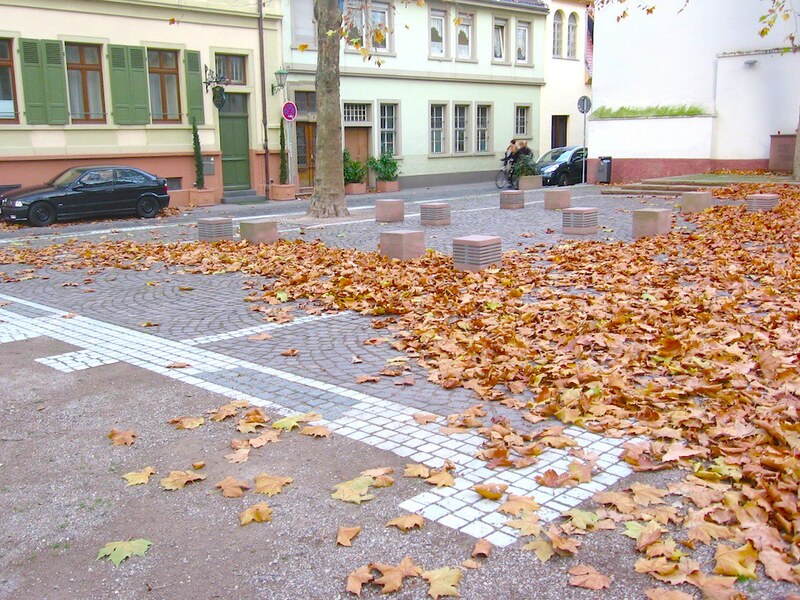 During the renovation of this square in 2001, white marble cobbles were used to mark the outline of the synagogue. The memorial stone marks the location of the Ark. A new Jewish community centre and synagogue were inaugurated in Heidelberg’s Weststadt in 1994. 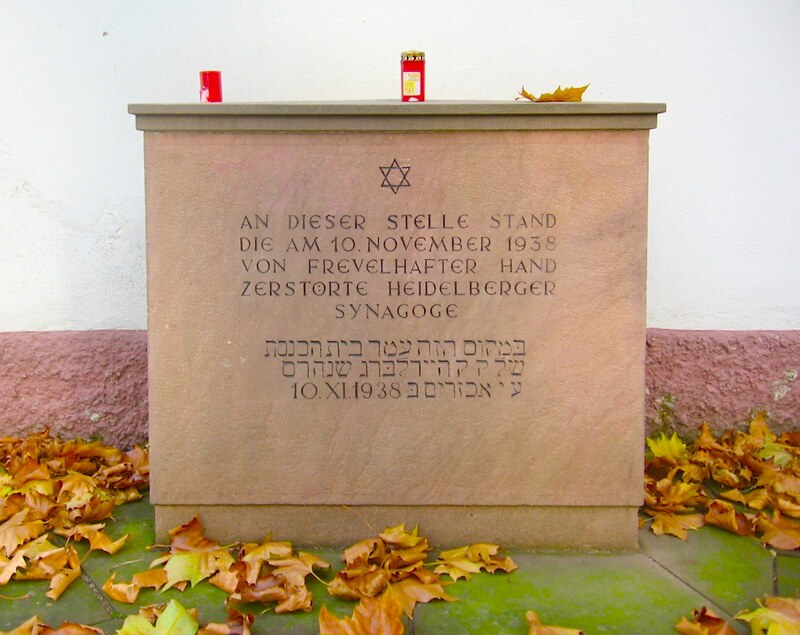 There are now brass “Stolpersteine” or “stumbling stones” with names acknowledging Jews who once lived in Heidelberg. Alter Synagogenplatz (Old Synagogue Square) is located in Heidelberg’s Altstadt (Old Town) at the corner of Lauerstrasse and Grosse Mantelgasse. Except for the last photo, I made all of the photos above on 26 November 2006 with a Canon Powershot A510. This post appears on Fotoeins Fotografie at fotoeins.com as http://wp.me/p1BIdT-3Ze. • A number of German historians set up the website, 9nov38.de, to highlight events before, during, and after the pogroms of 9-10 November 1938; the website is in German. • Thanks to Enchanted Seashells for their post. • 2013 marked the 75th anniversary of Kristallnacht, and BBC News posed the question of whether anti-Semitism was on the rise in Europe. Holocaust survivor Margot Friedlander recently returned to her hometown of Berlin, where she has her own “Stolperstein”; she spoke to NPR about remembering Kristallnacht. In the past, I’ve often felt guilty for taking photographs at a cemetery, as if the act of opening and closing the camera’s shutter somehow “exposes and steals” the essence of people who are laid to rest. Only in the last few years have I overcome these feelings, as I now see cemeteries as beautiful places to visit and to witness frozen snapshots to individual lives over time. On this late-autumn afternoon, I stood in the middle of the garden, transported to a different place and a different time, surrounded by tranquility and living memories. Große Hamburger Straße (or Greater Hamburg Street) was the key central road in what was once the Spandauer Vorstadt, which was the suburb or town at the foot of the former Berlin city gates. The road allowed for trade and movement from Berlin in the direction towards the nearby town of Spandau. Historically, development of the Höfe went hand in hand with the growth of Berlin as a thriving urban centre. The expansion started around 1700 from an outer suburb known as Spandauer Vorstadt, located outside the Spandau City gate which already had its own church, the Sophienkirche as early as 1712. Friedrich Wilhelm I built a new city wall here and the former suburb became a new urban district belonging to Berlin. Today’s Hackescher Markt takes its name from the market built here by a Spandau city officer, Count von Hacke. The influx of Jewish migrants and the exiled French Huguenots gave the district the cosmopolitan diversity which it never lost. The first synagogue was built in this area and the first Jewish cemetery established on the Grosse Hamburger Strasse. Another name for the area, the Scheunenviertel (barn district) is associated today with up and coming art galleries and the more bohemian side of Berlin. The largest synagogue in Germany was built in nearby Oranienburger Strasse in 1866. In use from 1672 to 1827, this is Berlin’s oldest cemetery for the Jewish community. Buried here is Moses Mendelssohn (1729-1786), philosopher, a founding father of the Jewish Enlightenment, and grandfather to the great composer Felix Mendelssohn. During the last stages of fighting in the Second World War, 2425 dead were buried here in 16 mass graves. With no clear boundaries separating those buried in the past from those buried during the war, the new memorial garden was constructed and restored in 2007-08 with all of the buried left undisturbed as they were. The present location was also the site of the first nursing home in 1844 for the Jewish community in Berlin. The Gestapo transformed the home in 1942 to a collection and staging point for prisoners, and ordered the destruction of the entire site in 1943. 55000 Berlin Jews from infants to the elderly were deported and murdered in the concentration camps at Auschwitz and Theresienstadt. I also wrote about the “Shalechet” (Fallen Leaves) sculpture installation at the Jewish Museum Berlin. Visitors can reach the Old Jewish Cemetery with the MetroTram (M1, M4, M5) to Monbijouplatz; Strassenbahn 12 to Monbijouplatz; S-Bahn (S3, S5, S7, S9) to Hackescher Markt; S-Bahn (S1, S2, S25, S26) to Oranienburger Strasse; or the U-Bahn (U8) to Weinmeisterstrasse. After disembarking the train or tram at any of these stations, it’s a short walk to the cemetery which is located next to the Sophienkirche church. In Berlin-Mitte at Spandauer Strasse 68 (at Karl-Liebknecht-Strasse) a memorial plaque marks the location of the house where Moses Mendelssohn and his family lived; see also articles in German Berliner Morgenpost (3 May 2015) and Süddeutsche Zeitung (16 June 2016). I made the photos above on 21 November 2012. This post appears on Fotoeins Fotografie at fotoeins.com as http://wp.me/p1BIdT-2MX.